- We're currently looking to add an awesome team player to our staff and would love to hear from you if you're interested in joining us. Part-Time hours available. Must be able to work on weekends on a regular basis (as well as during the week), will be expected to lift bags up to 50 lbs (sometimes straw and hay bales 70+ lbs), you'll be helping us keep the store clean, the retail floor well-stocked, animals fed/watered, fill propane tanks, and most importantly must love animals! More specifics to be discussed. 18 years old or older only, please. Animal care experience and retail experience are a plus. - We welcome applications at all times. Thanks! 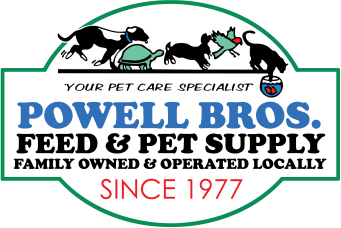 - Powell Bros. Feed & Pet Supply, Inc. is an Equal Opportunity Employer. Click here to complete and submit a Job Application form. Thanks!